Parahemophilia or Factor V deficiency is a rare coagulation disorder. It is an inherited condition that affects the ability of the blood to clot. It also termed as Owren’s disease, proaccelerin deficiency or labile factor deficiency. No apparent racial predilection for factor V deficiency exists. Factor V deficiency affects males and females with equal frequency. Factor V deficiency affects all ages. The age at presentation indirectly varies with the severity of disease. About 1 person in 1 million people is affected with this disease. Parahemophilia is caused by a large number of genetic abnormalities. It follows the inheritance pattern as being autosomal recessive. In thisdisorder, the plasma protein Factor V is low or missing. Thus, when certain coagulation is needed the chain reaction does not take place normally. Inheriting a defective Factor V gene or acquiring an antibody that interferes with normal Factor V function also contributes to the presence of the deficiency. Factor V is an essential component in the blood coagulation cascade. It is synthesized by the liver and in megakaryocytes. This plasma protein circulates in an inactive form. When coagulation is taking place, Factor V is converted to an active factor, Factor Va through a limited proteolysis by the presence of the serine protease a-thrombin. Factor together with the activated factor Xa forms the prothrombinase complex. This complex is the one responsible for the rapid conversion of zymogen prothrombin to the active serine protease a-thrombin. Thrombin cleaves fibrinogen to form fibrin, leading to the ultimate step in coagulation, the formation of a fibrin clot. Fresh frozen plasma infusions (FFP). Depending upon availability, solvent-detergent FFP may contain a more reliable level of Factor V than standard FFP. 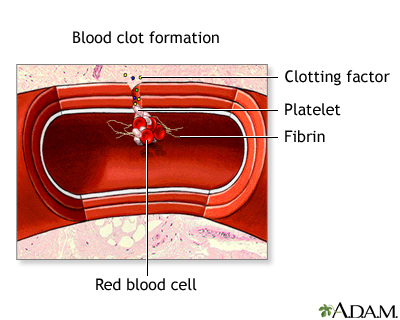 In acute cases of severe bleeding, the addition of platelet concentrates may be helpful. Patients with factor V deficiency can be given oral contraceptives to decrease menorrhagias, thereby improving anemia and decreasing transfusion needs. Tooth extraction in a patient with factor V hereditary deficiency is safely performed with both supplementation of FFP and application of local hemostasis.